Combine the soy sauce, honey, lime zest and juice, sesame oil, garlic and ginger in a large bowl or a baking dish. Add the pork chops and cover with cling film. Leave to marinate for 30 minutes at room temperature or overnight in the fridge. Transfer the pork chops to a baking tray and brush them with some olive oil. Pour the marinade into a small saucepan and bring to the boil for 1 minute. Remove from the heat, check the seasoning and keep beside the barbecue. Use a pastry brush to baste the glaze on the pork. 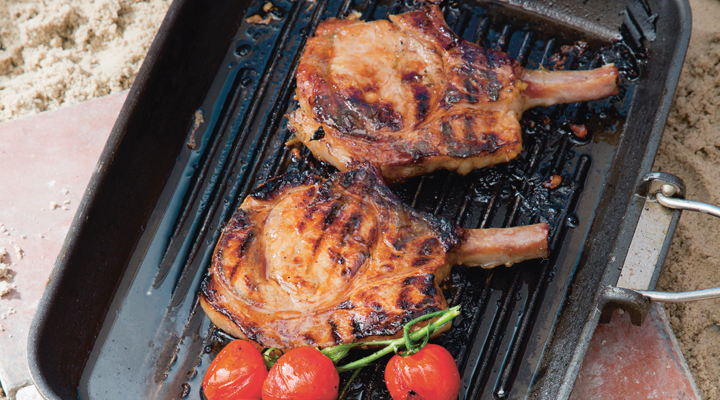 Grill the chops on the barbecue over an indirect heat for about 15 minutes, turning once. Baste with the boiled marinade while cooking. Meanwhile, put the baby gem lettuce and cherry tomatoes in a bowl and drizzle with 1 tablespoon of the boiled marinade, mixing well. Serve the grilled pork chops with the salad on the side.